Skydive Orange is the closest Super Twin Otter powered skydiving center on the way to Bridge Day at the New River Gorge Bridge in Fayetteville, WV (Fayette County, West Virginia) So if you are looking to skydive near the New River Gorge Bridge, this is the place to come to to make regular jumps on your way to the bridge day jumps! When you skydive Virginia's skies over Orange, you skydive Virginia's friendliest skies! Come fall for us! Serving VA, MD, DC. How to Stop Telephone Solicitors- Telemarketers can be stopped once and for all, but it will take a concerted effort by all good citizens. Staunton Waynesboro Internet Service Provider information! Overnite Transportation- Overnite Transportation Company has great service and is the nation's fifth largest less-than-truckload (LTL) motor freight carrier. 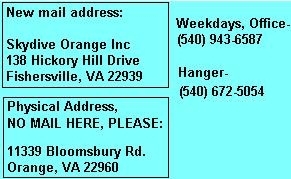 Virginia Rigging Services - full service, sport parachute rigging and repair. Senior Rigger Jim Wine, and his team of professional skydivers! Parachute systems inspected, packed and maintained. Lost Prairie Montana- outstanding skydiving!